Our farm is centered in a belief that land is alive and precious, and must be nurtured for production of high quality food. We let our children out in the blueberry fields to graze on health. We offer a product from the soil which can only be described as the best we are aware of, knowing that only the best organic practices have been employed. We research, test, and toil over our farm for you, the discerning customer. We ended our last season tired and satisfied that many of our friends, neighbors and folks we do not even know have wonderful food for their tables. Perhaps you have enjoyed a fantastic meal at a local restaurant and have tasted our product. We are happy to deliver our fruit all over the area during our season. The earliest we have opened is the 9th of July and the latest is the 12th of August. We usually are open three to five days a week for about six weeks before we close for the year. 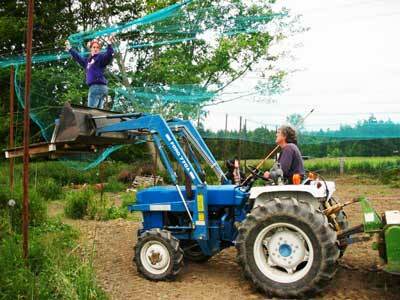 What kind of work goes into building a “Certified Organic” blueberry farm? We researched growing blueberries for three years before we planted our north field in 1999 (the south field was planted in 2001). It was wonderful to talk to growers in Washington, Oregon, and British Columbia. We found out that most people do not grow organic because it requires much more time, money and labor. 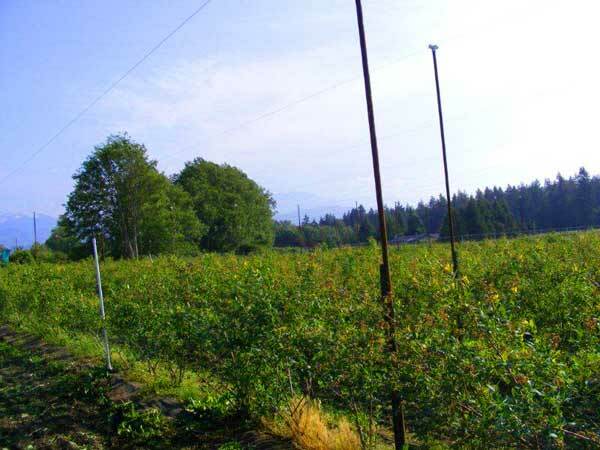 During the fall, winter and spring, activities such as putting up and taking down the net, adding amendments, tilling, irrigating, pruning and weeding keep Blueberry Dave almost constantly in the field (when he is not working at his other full-time job). Much of the time, other workers are employed to help with these functions. Although we work very hard to keep the weeds down, they love our soil as much as the blueberries do; you will see this evidence when you visit us! We view hand-weeding our nearly 3,700 plants as being similar to painting the Golden Gate Bridge: as soon as you finish, it's time to start over again. Obviously, all of this extra work (we can't just spray the weeds away), in addition to our other soil-nurturing practices, result in added costs in order to bring you the best-tasting, most nutritious blueberries. We researched our soil, the water rights that we enjoy here in the Dungeness Valley, and the varieties that we would eventually grow. (Did you know that there are over twenty varieties of blueberries?) We chose Reka (New Zealand), Blue Crop, Duke and Spartan. We planted for machine harvest spacing in and between rows. Our soil is Dungeness Loam soil. It is near base Ph., so we found and added amendments to augment the natural elements. We arrived at our horticulture practices after extended discussions with seasoned farmers from both sides of the Cascade Mountains. We grow berries that have reached 1.25” in diameter. We have won blue ribbons every year that we've entered the Clallam County Fair. We are gratified to note that most of our customers return each year to enjoy our berries, thanking us for our efforts and complimenting our product. We hope to add you to this group!